RU-FI-OOOOOH! | Sohail Mirza, standing in for Peter. If you’re not certain how to perform some of these actions, you may find tutorials for them readily available online. If you’re like me, you might have a number of Ubuntu machines at home. If this is the case, you know it can be a pain to quickly update them all since the same updates need to be downloaded to each computer. If there are a lot of updates to be downloaded, this can take a while on a slower Internet connection. If this sounds like your situation, then you can speed things up by setting up an APT proxy on your network at home. APT is the tool your Ubuntu system uses to retrieve updates and manage the installation of programs. An APT proxy will basically allow you to designate one of the machines on your network as the update server — the one machine where all the others will get their system updates from. The idea is that the proxy will only have to download updates once, and these are then distributed to all the other Ubuntu machines on the network. To accomplish this we can very easily setup apt-cacher-ng, a proxy tool readily available from the Ubuntu repositories. I did play around with apt-proxy first, but found that less straightforward to use. Now that your proxy is ready to go — yup, it was that simple — we need to instruct all the computers in your home or office to go to that proxy computer for APT updates, and not to the public update sites on the Internet. This is fairly straightforward to do as well. In this line you’ll need to replace “ProxyComputerIPAddress” with the proxy computer’s address on your network. It’s address may look similar to an IP address like 192.168.1.100. You’ll need to perform this step on every computer, including the one running the APT proxy. On the computer running the proxy you can use the IP address 127.0.0.1, which is just a way for the computer to refer to itself; every computer can refer itself with the this IP address. Now that every computer will be going through the proxy, things should magically just work! At this point you can launch the Update Manager, and check to see if there are pending updates. That’s it folks, it’s that easy to setup an APT proxy. The result is that all Ubuntu updates should be cloned to your proxy server once, and that will now be the source of updates for all the computers on your network. Post to the comments and let us know how it works for you. This guide works with iTunes Movie Trailers as of Jan. 14th, 2010. My iTunes Movie Trailers Download script. Thank goodness for Firefox documentation: just use the easy-to-follow guide on installing extensions, but install Greasemonkey instead. What could be better than easy to follow instructions? HeaderControl is slightly more difficult to install and requires some additional configuring as well. Not to worry though, I’ve already covered it before. Please refer to the section titled “Setting up HeaderControl” in my last version of this guide. Just make sure you’ve got the User Agent string right (“Quicktime/7.6.2“). Go ahead, cilck that big, green button. Followed all the steps? Great, now you’re ready to rock and roll. Go ahead and try it out. You can't stop us Apple! Only a few days ago I was disappointed to find that Apple had once again broken movie trailer downloads for non-iTunes users. Thanks to the input of a few commentators on this blog, I think I’ve found a new workaround for Firefox/Greasemonkey users. The workaround uses a combination of the most excellent Apple Trailer Download script by zatic (not my modified version — I’ll get to this in just a bit), and a modification to the User Agent string that Firefox uses to identify itself to websites. First of all, you’ll need to download this great experimental Firefox addon, HeaderControl (Disclaimer: always use caution with beta/experimental software. I’m not responsible for any harm you may cause your computer). What we’ll be using HeaderControl for is to enable a modified User Agent string for only the Apple trailer download site. Some of you may have the popular User Agent Switcher extension installed, which could work as well, but I chose HeaderControl for this workaround because it allows per-domain user-agent switching. The “per-domain” bit means I don’t have to keep switching the Firefox user agent for the trailers site, and back again. Now, once you’ve installed HeaderControl, reboot Firefox and bring up the preferences dialog for HeaderControl. Clicking the “Add” button, go ahead and create a new per-domain configuration for the domain, movies.apple.com, and specify the custom user agent string “Quicktime/7.6.2“. Note that you’ll only need to choose the “Mangle HTTP ‘UserAgent'” option. You can leave alone the Referer and Language tabs. Make sure the suffix is "movies.apple.com" and that you have the user agent correct. Press “OK” to commit the new per-domain filter, and you’ll be good to go. For those of you who do not care to download the trailers but just want to watch the trailers in your browser, you should be good to go. Go ahead, hit up the trailers site and watch something special. For those of you who want to download the trailers but don’t know how, you can refer to my original instructions, which should now work again. Finally, if you’re amongst those who followed the steps in my previous post on the issue of Apple trailer download breakage by installing my modified Apple trailer download Greasemonkey script, then you have one more step to complete: disable my script and go back to using the original Apple Trailer Download script by zatic. Disable my "fixed" script. It's no longer required. Once you’ve done this you should find yourself able to download movie trailers from Apple’s site once again. Apple sez no trailers for you. 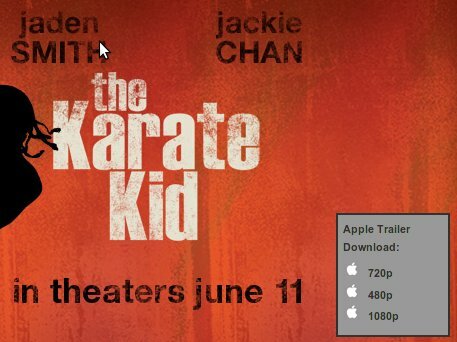 Wow, Apple seems very determined to break Apple Movie Trailer downloads for non-iTunes users. In their latest salvo at everyone who does not own a Mac and those who choose not to use iTunes, Apple has corrected both the www hack and user agent hack outlined in my last post on the topic. This also renders my Greaseonkey script useless. For the time being, I don’t have another workaround or fix to try, but as soon as I learn of one, I’ll be sure to share it. Another workaround, one that would also be simpler for Windows users, is to try using the User Agent Switcher Firefox extension. Just make sure to use the Quicktime User Agent string in the examples above. Windows users intent on using wget can try their luck with the GNU Utilities for Win32. Update: Krunk from hd-trailers.net has commented that direct download will work if you just tweak the URL a bit. Where the trailer typically comes from movies.apple.com, just change that to http://www.apple.com. Be sure to check out their download guide. Update 2: I’ve uploaded a fixed version of zatic’s original Apple Trailer Download script to userscripts.org. I’ve simply applied the fix noted in the previous update, to the original script. Ever wish you could press in Firefox and get focus on the first form field of the page, ignoring all the links? Or maybe you want to tab between all form elements with the exception of text fields? Or perhaps you want tabbing behaviour that is some combination of the above? The developers behind Firefox realized that people would want tab behaviour conforming to their personal keyboard accessibility requirements, and to this end they’ve included a very handy means of getting the behaviour you want. Enter the accessibility.tabfocus configuration. This property allows you to specify an integer corresponding to a particular tab focusing behaviour. 2 – Give focus to all form elements except text fields. 4 – Give focus to links (and linked images) only. The value for accessibility.tabfocus can also be an integer like 7 (which is the default value). 7 (1+2+4) implies that Firefox will focus all field elements and links as well; its effect is the behaviour of 1, 2, and 4, combined. You can read up a bit more to understand the different values. Accept the disclaimer that you may break Firefox if you don’t know what you’re doing. I’d advise the reader to be careful about what they do beyond this point! The 'accessibility.tabfocus' property on the about:config page. Now just double click the property to be prompted for a new value. Personally, I would like to tab through all form fields while ignoring links on the page. To achieve this outcome, I used a value of 3 (1 + 2), a combination of tabbing through text fields and tabbing through other form fields. I hope this Helpful Hint is of use to those of you who are big on keyboard accessibility.